A typical universal receiver for testing loads and capturing chamber pressure as well as velocity. This one is ready to test what appears to be .44 Magnum loads. Photo courtesy of PCB Piezotronics, Inc.
A universal test receiver setup with a 12-gauge barrel, fitted with a piezoelectric quartz pressure transducer to capture chamber pressure and velocity data. Photo courtesy of PCB Piezotronics, Inc. It is a typical Saturday morning at your local gun club, and along with the large gathering of shooters, are shotguns and ammunition from just about every conceivable manufacturer. Today the shooters will give little, if any, thought as to whether the ammunition they have purchased will fit and fire safely in their favorite shotgun. For that, they can thank the Sporting Arms and Ammunition Manufacturers’ Institute, the industry-sponsored institute commonly known as SAAMI. First, a little bit of history. It could be said SAAMI is a child of World War I when in 1913 the U.S. War Department encouraged American producers of military arms and ammunition to establish a means to exchange technical information. The resulting organization served the U.S. and Allied cause throughout World War I, and on May 17, 1918, with the endorsement of the association’s purpose and aims by the government of the United States through the Secretary of War and Secretary of Commerce as being “worthy of continuance in during post-war conditions”, the resulting organization was registered as the Society of American Manufacturers of Small Arms and Ammunition (SAMSAA). For reasons lost to time and history, the Society became inactive in the early 1920’s. In the mid-1920s with smokeless powder replacing black powder and semi-smokeless powder in practically all sporting ammunition, the need for a revival of the Society became apparent to powder makers and ammunition loading companies. The firearms manufacturers of that era were also concerned about the performance characteristics of smokeless powder as compared to black powder and semi-smokeless powder. This had an obvious connection with safety. In 1925 Congress, through the U.S. Department of Commerce, recognizing safety concerns and the even larger issue that the U.S. was still suffering from strategic materials shortages caused by World War I, requested the industry to revitalize SAMSAA. 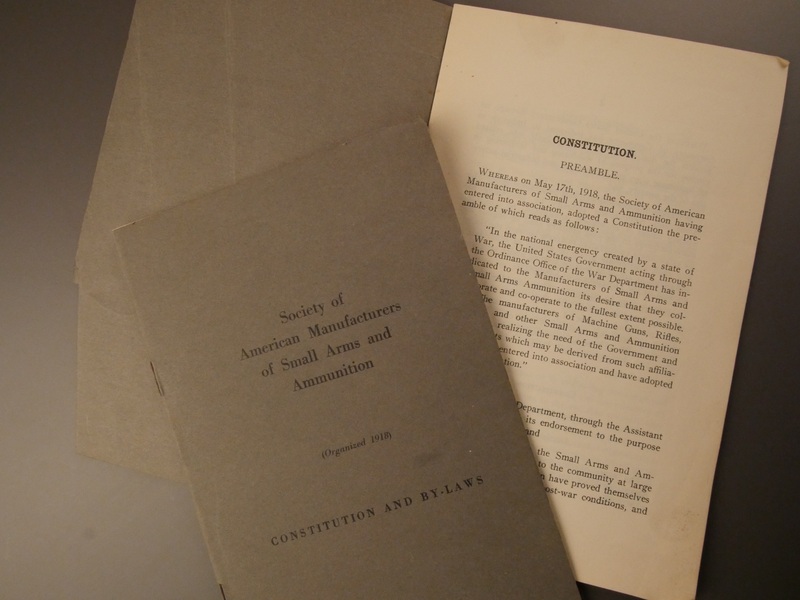 By late 1925, representatives of all smokeless powder producers, every major ammunition loading company and most of the important makers of shoulder firearms agreed SAMSAA should be re-established. This took place in January 1926, with the new body being incorporated as the Sporting Arms and Ammunition Manufacturers’ Institute. The first major project undertaken by SAAMI was a cooperative product simplification program with the U.S. Department of Commerce to reduce the waste of strategic materials such as lead, copper and brass and the related capital, storage and transportation costs associated with supporting thousands of obsolete or near obsolete black powder and semi-smokeless powder loads for shotshell and metallic cartridges. When this program began, over 4,000 different shotshell loads were available in the marketplace. The government-sanctioned SAAMI conducted program eliminated more than 95% of them. In metallic centerfire rifle and pistol cartridges, the nearly 350 loads offered were reduced about 70%. Most sportsmen and women familiar with SAAMI consider it to be the technical arm of the firearms and ammunition manufacturing industry. However, SAAMI has a significant place in the history of wildlife management. During the Twenties our nation’s game supply was decreasing at an alarming rate. Market hunting and changing agricultural practices had reduced our nation’s game supplies to an all-time low. State game departments were mainly staffed by political appointees. In addition, the dust storms of the early thirties fueled the need for the conservation of our natural resources, including wildlife. Consequently, SAAMI became involved in securing the future of our wildlife resources. In 1928 SAAMI was instrumental in commissioning and financing Aldo Leupold’s monumental wildlife studies that resulted in the publication of An American Game Policy and Game Management, books which were the first blueprints of scientific-backed wildlife management. From 1931 through 1935, SAAMI financially supported the Clinton Game School in New Jersey, graduating 145 of the first technically trained wildlife management employees of federal and state fish and game departments. Beginning in 1933, the gun industry had been subjected to a 10% federal excise tax, a levy that evoked no cheers from the gunmakers or anyone else. After all, this was in the depths of the Depression when the excise tax on a $30 shotgun would put a considerable amount of food on the family table! The little matter of a gun excise tax, tacked on to the retail cost, could (and probably did) turn away customers. The original excise tax on firearms was channeled directly into the general fund. None of it was spent for wildlife purposes. However, in 1937, the Pittman-Robertson Federal Aid in The Wildlife Restoration Act was passed, providing that the federal excise tax on sporting arms and ammunition be earmarked for wildlife restoration. SAAMI’s executive committee, through the efforts of John Olin of Western-Winchester, was instrumental in gaining industry’s full support of the proposed new program and incorporating the findings of Aldo Leopold’s wildlife survey. The primary work of SAAMI remains in developing technical standards for the design and manufacture of sporting arms and ammunition. SAAMI’s mission is guided by a very small paid professional staff of four who manage the daily affairs of the institute and coordinate the activities of a number of strategic committees, the principal committee being the Joint Technical Committee (JTC). The JTC is comprised of technical representatives from the 31 SAAMI member companies that hold voting status. The JTC meets biannually, every January and June, while additional technical Task Forces or Working Groups may hold additional meetings throughout the years as projects require. The JTC is comprised of three sections: firearms, ammunition and muzzleloading. While each section is tasked with overseeing the proposal and ongoing maintenance of standards relative to their manufacturing sector, the Joint Technical Committee brings all the sections together to discuss technical issues affecting multiple sections, such as a new cartridge and chamber design introduction. It is essential both the ammunition and firearms sections review and approve the design and operating characteristics to ensure the functional safety of the new design from both the perspective of the ammunition and the intended firearms. SAAMI, as an accredited standards developer to the American National Standards Institute (ANSI), has coordinated the collection and distribution of technical data among its member companies and to the industry at large. SAAMI sponsors five American National Standards which were developed by Product Standards Task Forces of the SAAMI Joint Technical Committee. 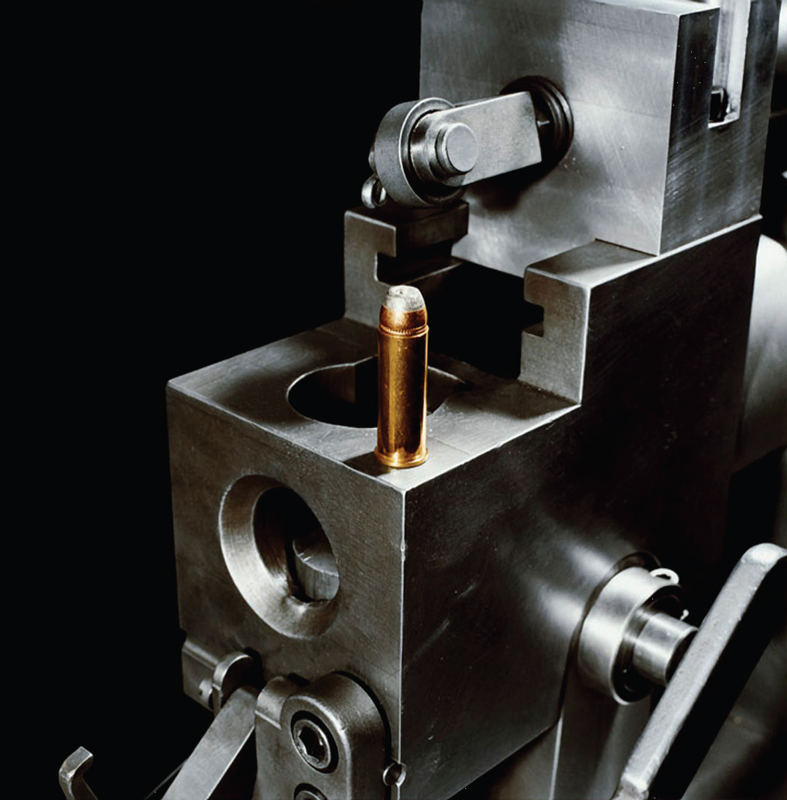 The five standards set forth dimensional and performance criteria and recommended testing processes and procedures for ammunition or firearms. Each standard is subject to approval by the canvassing and consensus vote of materially interested parties representing: product end users, government agencies and departments, independent materials testing laboratories, non-SAAMI member companies and independent consultants and experts in the field. Upon canvass approval, the standard is submitted for affirmation by the ANSI Board of Standards Review. Of these characteristics, two stand out as examples of the cooperative work of the Institute’s Technical Committee representatives in the quest of mutual benefit and increased safety: 1. Velocity and Pressure and 2. Reference Ammunition. Shotshell velocities, until about 1940, were measured over a 40-yard range. A SAAMI member company developed the radio-frequency coil-disjunctor system, which measures velocity over a 3-foot range. Other member companies assisted in debugging the system, and the technology was made available to the ammunition industry as a whole. In the area of centerfire ammunition, the industry adopted for commercial use the photoelectric screens and electronic quartz counter chronographs. As a result, the velocity ranges for centerfire were reduced from 150 feet to 25 feet. As a result, new ballistic laboratory range construction costs were drastically reduced because of the shorter distance requirements. Today, the latest infrared detector screen and Doppler radar technology is being developed to its full potential. For decades, the copper and lead crusher was the mainstay of cartridge pressure testing. The present piezoelectric transducer system for measuring chamber pressures, which is faster and more precise than the copper and lead crusher systems, was a joint development of SAAMI members and the instrumentation industry. With few exceptions, most all rimfire, centerfire pistol and revolver, centerfire rifle and shotshell pressure measurement is now done by piezoelectric transducer. The development of the SAAMI transducer allows for a much more accurate measurement of the true pressures, which are developed in the chambers of firearms and greatly assists ammunition ballisticians and gun designers’ evaluation of new cartridge and firearm designs. Reference ammunition, ammunition chosen for its very consistent and uniform velocity and pressure, is the base on which all SAAMI member companies and non-SAAMI members who subscribe to the use of the SAAMI ANSI standards, can control the loading of ammunition so the critical performance characteristics, pressure and velocity, fall within established perimeters from brand to brand. It is the means of evaluating the acceptability of pressure test barrels, chronograph systems, the calibration of transducers, ballistic laboratory equipment setup and operating procedures. Reference ammunition is a significant part of ammunition and powder makers’ quality control processes, enabling them to evaluate production. This gives assurance that commercial ammunition offered by one maker performs in a manner comparable to that which is offered by another maker, an assurance firearms makers and shooters alike should find comforting. Each lot of SAAMI reference ammunition is subject to scheduled “round robin” tests throughout the life of the lot. This testing is coordinated by the office of the SAAMI Director of Technical Affairs. Select ballistic laboratories submit velocity and pressure test results to the office of the Director of Technical Affairs where the data is analyzed and compiled using the established statistical confidence factors and inclusion limits as set out in the ANSI SAAMI standards. The results are published in a periodic assessment made available to SAAMI member companies and non-member companies by subscription. Another significant activity for the SAAMI Technical Committee is the area of standardization of the fit of cartridge and chamber. Before the advent of the Technical Committee, it was necessary for any manufacturer who intended to produce either a gun or ammunition similar to that produced by another manufacturer to purchase several weapons and a quantity of ammunition. From measurements of the weapons and ammunition, the manufacturer could determine the dimensions he should use in his own manufacture. Considerable time and much expense were involved in measurements before final dimensions could be established. SAAMI, through the efforts of the Joint Technical Committee, has made available uniform drawings of the cartridge/chamber at maximum and minimum material conditions. SAAMI protocol evolves around the principal that a chamber based on the SAAMI minimum dimensions will accept and function safely with a cartridge based on SAAMI maximum cartridge drawings. SAAMI defines two definitive headspace dimensions for chambers, minimum and maximum. 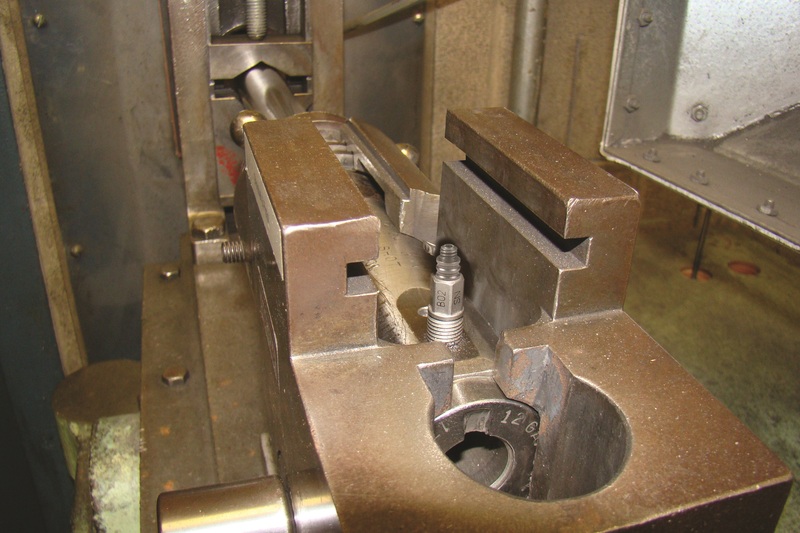 OEM (original equipment manufacturer) firearms manufacturers may utilize custom ground headspace gauges based on SAAMI minimum and maximum to target specific production steps, such as assembly accept/reject headspace gauges and post proof-test headspace accept/reject gauges to account for locking lug setback. Headspace gauges terms “go”, “no-go” and “field” are not recognized by SAAMI, because the various makers of headspace gauges do not use the same dimensions for what is termed “GO”, “NO GO” and “Field”. Another vital area of activity for SAAMI, through its Joint Technical Committee, has been the establishing of uniform proof practices. The American gun industry enjoys freedom from control by the federal Consumer Product Safety Commission, a privilege the ammunition and firearm industries do not take lightly. This situation does not exist in other countries. The European governments established by treaty an association, the Commission Internationale Permanente (C.I.P. ), which prescribes the loads, methods and procedures by which firearms are tested for safety and in certain countries this is done in a central Proof House. Elsewhere, it is done at the factory under government surveillance. The SAAMI Joint Technical Committee has recommended a sound system of proof testing conditions, procedures and proof loads for all types of commercial firearms generally followed by the major firearms producers. It unquestionably results in the production of safer firearms for the shooting public, and the voluntary industry-established proof levels and practices have stood the test of time and scrutiny, negating the need for government control in the name of “public safety”. 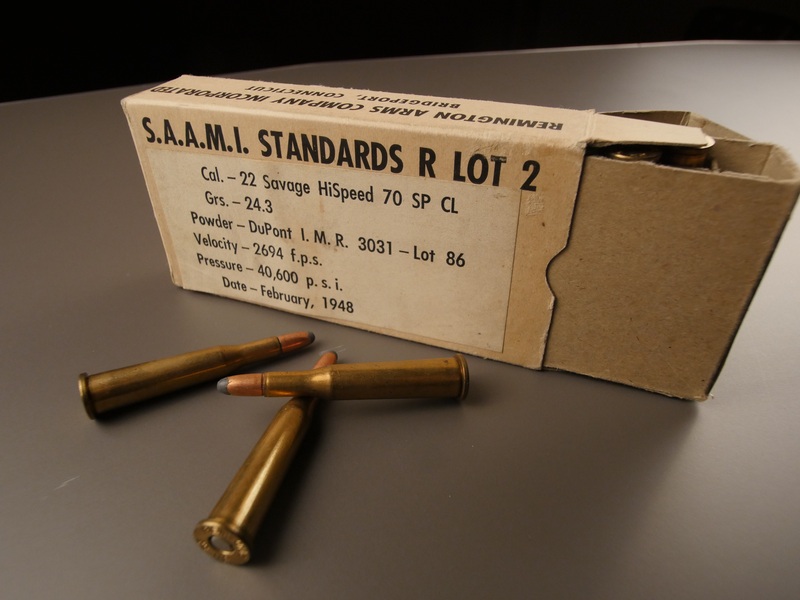 Continual improvement and updating of the ANSI/SAAMI standards is essential to maintaining SAAMI’s worldwide status as a recognized authority in the field of ammunition and firearm manufacture and testing. ANSI/SAAMI standards are the heart of significant cooperative relations between SAAMI and many federal and state agencies that reference or use the ANSI/SAAMI standards. The liaison functions of SAAMI maintain communication with many organizations, such as: C.I.P. (Europe Union & England); Birmingham Proof House (England); London Proof House (England); National Bureau of Standards & Technology; Department of Homeland Security: The Federal Law Enforcement Training Center, Immigration and Customs Enforcement National Armory; U.S. Department of Defense: Picatinny Arsenal, Aberdeen Proving Ground, Crane Naval Surface Warfare Center; Federal Bureau of Investigation, Ballistic Research Facility, Quantico; Association of Firearms and Toolmark Examiners (AFTE). Through collaborative efforts, C.I.P. and SAAMI are working towards the development of internationally recognized standards. SAAMI and C.I.P. work cooperatively to ensure technical data for all new cartridge and chamber designs submitted to either entity is shared to ensure interchangeability, safety and satisfactory performance. In addition, SAAMI and C.I.P. are working closely to coordinate their pressure-testing programs. In what is probably unique to the ammunition and firearms industry, the SAAMI Joint Technical Committee provides a forum for industry-wide consideration of technical problems as they arise. It also gives the opportunity for communication and interaction with peers from other companies, and in some instances, shares in the planning and execution of special test programs. Ideally, the members of the SAAMI Technical Committee are persons responsible for product design or quality control, aware of consumer complaints and have the cooperation of the management team within their companies. Company representatives have the authority, within reasonable bounds, to speak and act for their companies on technical matters. Members are free to introduce subjects not of a proprietary nature to obtain opinions, reactions, suggestions and possible solutions from knowledgeable, experienced personnel from other companies. While the technical standards are the core of SAAMI’s mission and of most interest to shooters, we would be remiss if we did not take a moment to look into the work of the other committees that have, or still do, function under SAAMI’s umbrella. Suffice to say, committees such as Legal and Legislative Affairs, the SAAMI Logistics and Regulatory Affairs Committee, the International and United Nations Committees have an equally long record of significant contributions to the joint interests of the SAAMI membership. The Legal and Legislative Affairs Committee is responsible for tracking developments at the state and federal level in the field of product liability law and legislation that impact the design, manufacture and sale of firearms, ammunition and propellants by SAAMI member companies. The SAAMI Logistics and Regulatory Affairs Committee (commonly called “SLARAC”) works to shape the constantly evolving transportation and storage regulations, both international and domestic, so SAAMI products can be distributed economically, securely and safely throughout the world. Education is a key function and SLARAC is dedicated to providing science-based information to regulators. The committee also keeps SAAMI member companies up-to-date on applicable changes in regulations. SLARAC’s direct involvement in developing the ORM-D, now referred to LQ “limited quantity”, exemption for sporting ammunition, propellant powders and primers saves the shooter an estimated $400,000,000 a year in transportation charges. SAAMI has over the years been very involved in addressing international treaties and accords that will adversely affect shooter and firearms and ammunition industry worldwide. SAAMI is an accredited United Nations ECOSOC Non-Government Organization (NGO) with Consultative Status. For the last 25 years SAAMI has provided the UN with technical information related to SAAMI-member company products. The issues facing the UN are daunting and complex. SAAMI’s goal is to be “the” technical resource for decision-makers that influence international policies on sporting small arms and ammunition. Since SAAMI has at its disposal the technical knowledge of the manufacturers of firearms and ammunition, SAAMI is in a unique position to provide factual and reality-based information. Randy Bimson’s career spans 47 years in the firearms industry. He is an accredited design engineer, journeyman gunmaker, expert witness regarding firearms and ammunition, a former columnist for Shooting Times Magazine, and has made significant contributions to the publication of Brownells, Inc. Gunsmithing Kinks and VSP Publications The Ruger Single Action Revolvers, A Shop Manual, Vol. I & II. He held the position of Manager, Technical Service and Factory OEM Parts with Brownells, Inc. and Technical Support Manager with Beretta USA. In 2011, he was appointed the Director of Technical Affairs and Technical Advisor at the Sporting Arms and Ammunition Manufacturers’ Institute (SAAMI). An ardent big game and upland bird hunter, Bimson has hunted extensively on four continents. A certified firearm safety master instructor for rifle, pistol and shotgun, he is an accomplished competitive rifle and handgun shooter who wishes his ability to wingshoot equaled his appreciation for fine shotguns!